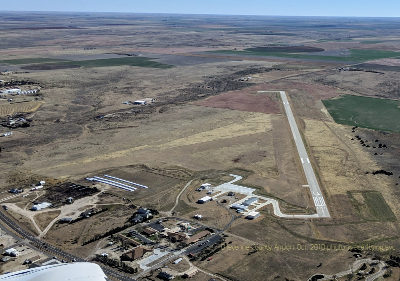 For information about Cheyenne County Airport (kSYF), as well as current weather, please click here. We don't offer formal on-call services, but if you contact us in advance, we will always try to accommodate you after-hours. The current price on 100LL is $4.70/gallon at the pump--no fuel truck. 100LL fuel is available 24/7 via a QT Pod automated dispenser which accepts credit cards. The QT Pod automated system accepts Visa, MasterCard, Discover, American Express, EPIC, Multi-Service, US Government AIRCard, and AVCard. During normal business hours, we can also provide fuel directly, which would allow you the option to pay with cash or check. The pricing is the same no matter which system that you use. We have a crew car available 24/7: donations accepted, no charge. We have a crew car available 24/7. Please contact us to reserve it. If you want to reserve the car for use during business hours, please contact us in advance. There are no car rental services in Saint Francis, but Avis in McCook, Nebraska, (kMCK) will deliver here a car here. There is also a community ride service which will take you anywhere in the county in their van for free. There is a fee for longer rides. To schedule the community van, please call 785-772-1053 during business hours or click the above link. Our two high-time CFIIs provide Biennial Flight Reviews (BFRs) and Instrument Proficiency Checks (IPCs) in your aircraft. If you need tail wheel time, we have more than 25,000 hours in conventional gear aircraft. We presently do not offer rental aircraft or primary flight instruction. For those services, please contact us and we will be happy to you find local availability. Tiedowns are free: on the ramp south of our office. Tiedowns are free, on the ramp south of the office. If there are no chains attached, you will find them on the south side of our office. Overnight hangar space is unlikely. For aircraft maintenance, we recommend Butterfly Aviation in Goodland, Kansas, as the closest full-service shop. We can air your tires, possibly provide an engine preheat, or help you plug into 110 volts AC for your engine heater. The Cheyenne County Airport is walking distance to several restaurants, and we have people who fly in just for that reason. The airport is walking distance to several restaurants, and there is a world-class motorcycle museum downtown. There is an excellent motorcycle museum downtown, on main street. This museum is well worth your time. Other attractions include the Cheyenne County History Museum, the Quincy Art Gallery, the fascinating Arikaree Breaks, Keller's Pond and River Walk, Sawhill Park with its restored ampitheater, Cherry Creek Encampment historic site, Riverside Golf Course, and the lovely, restored Cheyenne Theater which shows digital movies with surround sound on the weekends. To learn more about these attractions, please check out the City of Saint Francis website.